Poolesville is one of the longest-running (I think only Jeff Cup has been running longer) races in the MABRA region. It's notorious for a mile-long stretch of gravel repeated on each lap. As you can see from the photo, it was a little muddy out there on Saturday. Muddy, wet, and cold--perfect weather for a spring classic, but a month too late; my brain has already moved on (with the pro peloton) from Belgian weather to California sunshine! I think many MABRA women were in a similar mental space, because only 15 of us lined up to contest the 4/5 race (21 were pre-registered), including myself and 5 VWS teammates. And in spite of the fact that it's May and I expect a little sunshine and a little warmth, I Belgianed up, put embro on my legs, and went with bare arms. We started neutral until the first turn, at which point two of my teammates regulated the pace at the front. We took turns attacking and countering, while Bike Rack and NCVC chased us back. The RCV racer picked up the pace going into the gravel turn, but everyone took it easy and kept it upright through the turn itself. The gravel had two decent lines, one on the left and one on the right. One of my teammates had done recon earlier in the week and said the left line was better. I followed an NCVC racer up that left line. She drilled the pace and we left the pack behind. Before we lost touch with the peloton, I heard a teammate call out "Flat!" So I knew that VWS was down to 5. My NCVC companion kept the pace high through the gravel, and we briefly traded turns on the front once we were back on pavement. The pack quickly reeled us in. I looked around and realized that our A rider was missing, so we were down to 4 VWS riders in the pack. My memory gets a little fuzzy around this point, in terms of sequence of events. I know I attacked again at some point and was pulled back. I remember the racing felt hard, and I spent a good amount of time recovering in the back. I remember covering at least one attack. The critical move came when one of my teammates attacked and got a good gap. A woman from the Bike Rack followed her. Nobody else did, though, and two of my other teammates went to the front of the pack and rode tempo. The peloton let them sit on the front; I think everyone was happy to ride an easy pace for a while. Off in the distance, I could see the Bike Rack rider with a gap on my teammate. When we came through the start/finish line at the beginning of our second lap of three, one of our male teammates mentioned that she had almost bridged up to the break. I was nervous about that; was she struggling? Did she have the legs to stay with the Bike Rack rider? Should we try to bring the break back and try to attack again later? My teammates started to accelerate the pace on the front at the beginning of the second lap. They weren't chasing the break back; they were trying to shake a few more riders out of our group. It certainly worked! Our group went down to about 8 riders, and some of them were just barely hanging on. The pace picked up again on the gravel thanks to the same NCVC rider, and I stayed with her. Everything came back together on the pavement, and shortly thereafter I felt my handling get squirrely. I had a flat tire. I kept the bike upright and sashayed along as best I could on my rear rim until the sweep vehicle came along to give me a ride back to the start. I cleaned up a little, put on warm, dry clothes, and then headed back to the finish line . . . In time to see my teammate win! She had stayed off the front for most of the race and dropped the Bike Rack rider on the last corner. A second teammate came out best in the field sprint to take third place. 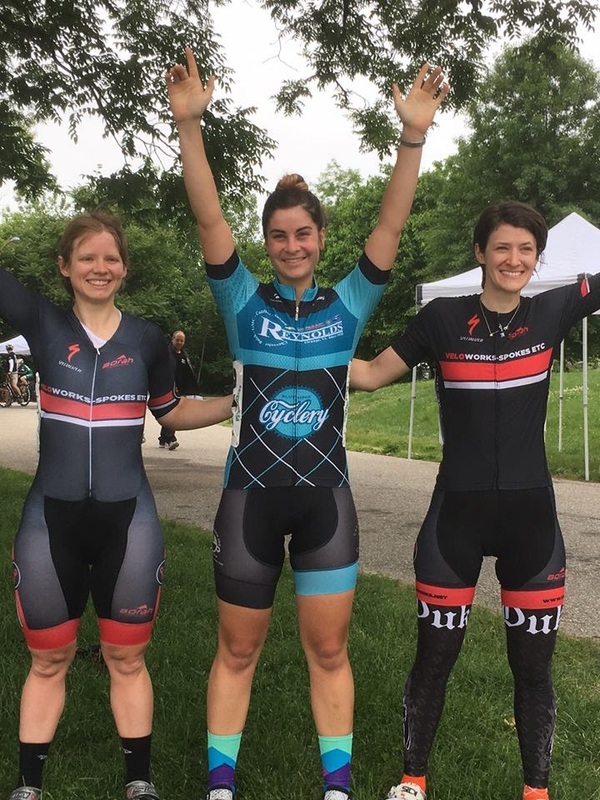 Another multi-podium for the VWS Ladies! Tactically, the real stars of the show were my two teammates who controlled the pace in the pack from the time the break went until the end. Without them keeping the pace slow, our winner probably couldn't have stayed away for over 20 miles with only one other rider. I was disappointed to flat out and DNF, especially since I felt more than able to hang with that second group for the rest of the race (one teammate described the pace they were setting as "tea party pace"). But I was able to do my job in the first lap and a half, and the result came out exceptionally well for our team. It was a fun day on a challenging course, made more challenging by cold, wind, and wet. Out of 15 starters, only 11 finished--two flats, one broken spoke, and one broken rear derailleur hanger. Pretty epic race, if you ask me! Next weekend, I'll be heading to BikeJam in Baltimore to race the Kelly Cup. It's a criterium, and I'll be bringing pit wheels so I don't have two DNFs in a row! Trusty steed after the race. Notice the squishy rear tire. Trusty steed after a bath. Much better! I'll try to keep these brief, because there are three! Of our cat. 4 group, I was the only woman registered for Bunny Hop on Saturday. Ride Sally Ride (Sunday) was the big team-focused race. My plan was to go to Bunny Hop and get as many upgrade points as I could. I want to be able to upgrade to cat. 3 with the rest of my team, because many of them are close! I'd never done Bunny Hop before (it was cancelled last year) but it was on a new course this year anyway. The race organizers had posted a video of the course, which made it look very technical with rough pavement. Many of us were nervous about how the course would play out, especially in a beginners' field with rain in the forecast. We needn't have worried! The course was fun and safe (or as safe as bike racing can ever be) and it stayed dry in spite of occasional cold, spitting rain. It was in a derelict office park that's now used for autonomous vehicle testing. The pavement was fine, smooth through most of the course with only a few well-marked potholes and seams. The finish line was on a long, curving, exposed stretch that started out head-crosswind and ended with a tailwind past the line. Then there was a hard right turn with a tailwind and a slight downhill, a few sweeping curves into a short uphill, a right-left chicane and a hard right turn, then another gentle turn to the left about 300 m from the finish line. A somewhat technical course, and I wouldn't want to take some of those corners more than three abreast (almost never a concern in the fields in which I race), but it felt safe to me throughout my races. Scoping out the competition before the race, I had my eye on a fellow racer from Sticky Fingers. I knew her wheel would be trustworthy where many of the women were of unknown reliability. And I was pretty sure that if we teamed up we could get a gap on the field and stay away. With so many unknowns in the field, I started the pace off hard to set an expectation for a fast pace. I settled in after the first turn and let the field come back together a little. I looked back to see if everyone was still there. I tried to keep the tempo high and encouraged the front 5 or 6 women to work together to force a selection. That continued until the first preme lap, which I used for it's intended purpose--to create a break! I took that lap hard and won the preme, then kept going at slightly higher than tempo pace to see how long I could stay away. Five or six women came back to me, and we started working together to keep the pace high and make that selection stick. When the pace slowed down significantly on the climb, I attacked across the road and got a gap. Stayed away long enough to get another preme, looked back and Sticky Fingers was on my wheel. Yay! This was what I wanted to happen! We worked together for the rest of the race. I told her to take the third preme, and we kept our rhythm going until the last lap. I heard after the race that one of the chasing pack tried to bridge up to us and almost made it but blew up and drifted back. My Sticky Fingers compatriot took the front on the last lap, which ended up well for her because she was strong enough to ride me right off her wheel! She gapped me on the last climb and I couldn't claw back before the end. She took the win and I took second place a handful of seconds later. There aren't many 3/4 races now that there's a women's 5 field. I took the opportunity to double up and try to pip another upgrade point or two. The 3/4 race had only 6 women, with a few apparently scared off by the wind and the rain. My plan was to sit in and do as little work as possible, since I already had one race in my legs. Sticky Fingers had two racers, but everyone else was there as a single; no teammates to work for us! As a result, the pace was really slow. No one wanted to burn matches on the front to keep it high. On the first preme lap, no one even bothered sprinting; the woman on the front of the bunch accelerated slightly and no one tried to come around her. She took the preme comfortably. I didn't have high hopes for winning the race, so I took a gamble on the next preme lap and sprinted from the 200 m mark. No one else came with me, so instead of sitting up after the line I followed the advice of the crowd to "Keep! Going!" I had a massive gap! I drilled it for another lap then tried to settle into threshold. I don't think I'm very good at judging what that is, yet; I think I end up going too hard and running out of steam. I stayed away for a few laps before an RCV rider bridged up to me from a gap of 7-ish seconds. I slowed down a little until she caught my wheel, then drilled it to pull away from the chase group again. Unfortunately, I drilled too hard, and couldn't catch her wheel when she pulled through. We both drifted back into the pack. I sat on the very back of the bunch and waited for a good opportunity. The pace was still pretty slow on the last lap. I'd planned to attack after the chicane, where no one was pedaling because they were preparing for the next turn. There wasn't really room, though, because we were so spread out. So I stayed in the back and waited for someone else to jump. I'm not sure who jumped first, but I held back for a few extra seconds and then stood and accelerated, surfing wheels to come from 6th to 2nd. Podium number two for the day--a double double! 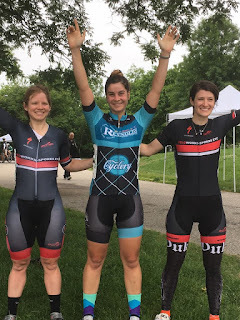 I enjoyed this race so much; I can't say enough good things about what a terrific crit Artemis Racing put on. I recommend it to everyone for next year! This was our big team race. We had 5 cat. 4s in the field and a solid race plan. The course is an office-park crit with three right-hand turns and two little stretches of elevation gain. It was cold and windy on Sunday, with a strong headwind after the first turn, a cross-headwind after the second turn, and a powerful headwind with a slight downhill on the finishing stretch. We began attacking from the beginning, opening up gaps and forcing everyone else to chase. Every time they brought one of us back, another would attack. Meanwhile, our A rider was staying sheltered in the pack. I got in two good attacks, one of which prompted a bridge from a Rock Creek Velo rider. We traded turns for a long time before the pack brought us back. On my second break, I was afraid I might actually stay away! As I came around with 10 to go and then 9 to go, spectators were shouting that my gap was growing and the pack wasn't working to bring me back! Besides the fact that it hurt a lot, it wasn't the plan for me to stay away! I was glad to see a teammate blow past me with 8 to go. I heard people shouting for me to grab her wheel, but I didn't have the strength and drifted back to the peloton. Another teammate bridged up to the first, so we had two working together off the front. The three of us that remained stayed positioned to disrupt any chasing efforts, then came together with 4 laps to go. I confess I got a little excited and started ramping the pace up too soon, with 3 to go. Patience, Jamie! With 2 to go, our A rider was on my wheel, and I was on another teammate's wheel. She drilled the pace for a whole lap and started a second before pulling off. Our A rider shouted to me "GO! GO!" "Wait, what? Don't GO?!" I replied, because my ears had stopped working and my brain had turned to jelly. "GO! GO!" she said again, and so I did. I buried myself right up until the final turn, going as hard as I possibly could and shouting my body down when it asked to stop. I pulled wide out of the final turn and our A rider came past me with open road in front of her. She took the bunch sprint to complete a clean sweep of the podium for Veloworks-Spokes Etc. As fun as it was to stand on the podium and win some premes, I had an even better time working together with my team. We executed our race plan to the tee and brought home a great result. I ended up in 7th, and my other teammate in 11th, but really we won the race. It was a marvelous team victory, some of the most fun I've ever had on the bike. I'm so grateful to be part of an awesome team! Today I'm introducing another kit review (you can find my previous kit review of the SheBeest Petunia bibs and Divine jersey here), this time of the Pactimo Ultra-Lite Women's Rain Jacket and their Quick-Release Changing Kilt. I bought both of these items with my own money; this isn't a sponsored review (although if anyone from Pactimo is reading this and wants to send me stuff to try, I will not turn you down!). I purchased these items from Pactimo about 2 months ago. Since then, I've had the chance to use the rain jacket twice, once in heavy rain, once in light rain, and the changing kilt half a dozen times. This rain jacket keeps water out, which is its primary function. It breathes better than most of the rain jackets I've used in the past, but it still gets very sweaty inside. That wasn't so bad in cooler weather, when I had a layer of warm fabric between the jacket and my skin. But now it's warmer, and the material clings to my arms and exacerbates the sensations of heat and sweat. A few weeks ago, when our team ride ended up feeling more like a team swim, I ended up taking the jacket off because I got so hot; I wasn't sure if I would get wetter riding with it or without it. I got much wetter riding with it, to the point that my jersey was flapping at my armpits, it was so saturated from rain. So I regretted taking the jacket off. I didn't realize how much it was contributing to my comfort until it was gone. The fabric of the jacket is thin and crepe-y, almost crinkly. The fit is very flattering for me. I didn't notice the jacket flapping down hills or at high speeds. The tail of the jacket is long enough to reach halfway down my hips, and has a silicone gripper to keep it in place. That keeps the jacket from riding up, but it also makes it difficult to access pockets when riding. I got the clear model so that I can use it for racing (that way you can pull the jacket on and officials can still see your number through it), but I think I would only use it in very heavy rain, or if the rain is cold enough that I'll be uncomfortable if I get wet. For light summer rains, it will probably be easier to suffer through the wet, especially since my races aren't very long in duration. I feel ever-so-slightly silly for spending $30 on what amounts to a very nice towel (or one of these), but I really like my changing kilt. The material is light and airy. It feels high-quality. The hook-and-loop (that's the generic term for Velcro, if you didn't know) makes it adjustable. It has a silicone gripper along with the elastic waistband for comfort and so it doesn't fall down and embarrass you. On that note, be careful on windy days with this product. Learn from my mistakes. The silicone gripper may be gimmicky, or overkill, or the kind of thing that a brand puts into a product to make it appeal to cyclists who could easily wrap a towel around their waists and change that way. Maybe I'm a sucker for buying one. But I love mine and use it at every single race and would walk around in this and nothing else post-race if I thought I could get away with it. Overall, I'm impressed with the quality of Pactimo's products. I like the fabrics they use; I like their attention to detail; I like the teams that they sponsor; I like that they offer so many products that are cut for women (most companies just have a unisex rain jacket, which will inevitably flap around my narrow shoulders and ribs); and I like that they've structured their minimums for custom orders to be especially favorable for mixed-gender teams. They seem committed to quality, with a manufacturing defect rate well below the industry average. They also have 5-piece minimums for custom orders, so if you want to get your own fancy skinsuits or jerseys with a custom design, or if you have a particularly small team, that's a low barrier to entry for customized kit. Two other things they do that I appreciate are a loyalty program and custom content. Their Pactimo Rewards gives you points for purchases, for referrals, for liking them on Facebook and following them on Twitter, for writing reviews of their products, and as a little gift for your birthday. Those rewards add up pretty quickly, to the point that I was able to get $20 off on my first purchase just for committing to follow them through social media and e-mail. Without that discount, I may have been less inclined to give their products a chance. They also have a library of articles, videos, and podcasts related to cycling and triathlon. It includes coaching and training tips, beginners' guides, and interest pieces. I appreciate that they're creating content to help people learn and improve, as well as high-quality products for sale. I like this brand. I support it. Pactimo comes off as serious and committed without taking itself too seriously. I appreciate that they are going out of their way to have a two-way relationship with their customers; they don't just make and sell quality merchandise (lots of companies do that), but also seem genuinely committed to creating value within the cycling community. I like that. I'm looking forward to purchasing and reviewing some of their shorts and jerseys in the future.